Summer, summer. What a dream. There's nothing that makes me hate winter more than basking in the beautiful glow of midsummer. Oh wait, no, winter makes me hate winter more. But other than that! I find these days that with my love of summer comes a latent rage against winter and I bemusedly ponder on how I try sooo hard to love it but we all know it isn't real love. And now, being a safe distance away I am free to loathe and rage with reckless abandon. But enough of that. Summer! I know the heat must get to me eventually, and so it shall, but what a joy June has been. Just an absolute joy. I recently clicked on an important article ranking the months from worst to best and I have to say, although I don't have quite such a disdain for November, the ranking seems pretty sound. Summer is here, at long beautiful last. (-- it sounded good in my head. I'm sticking with it) Like all parents, I wrestled with feelings of enjoying an unstructured life and going bat-crap crazy without it. I feel like this battle from within must add to the balance of the universe so I'm just going to allow it to happen and not get too worked up about it. If one day is crappy and lame, then let it be! Tomorrow is a new one, a chance to see if it's crappy too, or not, and it's usually not. Whatever the case, I like my summer to happen organically. Just like with a child, if I overplan or overbook a summer, it can't have the freedom and room to grow and develop on its own. I like to see what the hot summer wind carries and that is certainly one thing that can be relied upon. I live in the freaking windiest spot on this green earth. Remember that scene in the Keira Knightly version of Pride and Prejudice, when she goes to see the lakes or whatever with her aunt and uncle and there's that scene of her standing at the edge of the cliff in the moors and the music is sweeping and dramatic and Keira stands full-faced into a ginormous gale, her dress whipping violently behind her? That's how I feel every single day, it seems. And I channel Keira whenever I open the door, as in all things. And that's where it ends. We'll never know what I was going to say. Probably something about the wind getting real nasty here and ruining parties and things like such as. We had a couple backyard dinner things where actual food was being blown off plates, and then the plates themselves. It was ridiculous. Like, "Oh, you're going to want to have more on your plate than just salad and chips. Here's your salad, chicken, chips, and rock." Anyway. But no matter, i'm moving on. In bullets, here is how I'm spending my summer. Reading. Julian has finally reached that magic age where he wants to read and read a lot. I marvel that we spend our summer mornings lazing in bed, something he and I both love to naturally do. We are not fast movers in the early AM. And then he reads. Kid will read for hours in the morning. I thought I'd get him up and start him on jobs and chores and structure and then after a bit I was like, what in the good heavens for?! So I let him read and it was blissful. And, as anticipated, his school library is my favorite--for him and for books for me. 5th grade required reading? Yes, please. We started a science club. I did this a couple summers ago but only did one experiment and guess what? Same thing happened this time. This took place during my "need to plan and organize!" bliz/freakout but ultimately goes against my nature and I haven't cared to do another one. I love science club though. The first (and only) one was a hit and tons of fun and I really hope to have another one one day. Along that vein, I did start a bug board. Like an entomology board, where you pin bugs. I found a big dead beetle on my porch and that's how it began. Then i realized I'd need to kill bugs and realized I hadn't thought this through. So, so far I've pinned already dead bugs or bugs that needed to be destroyed but then carefully preserved. I have the beetle, a big green'ish housefly, and a giant mosquito that was flying in our house. I told Sean to get it and then yelled, "WAIT! Don't smash it! Is it preserved??" i have a real twisted relationship with bugs now. I drive through the canyon and see these giant monster butterflies and remark to myself what a lovely addition they would make to my collection. I even found a dead one in the parking lot and even had a ziplock bag for it! But then i tucked it in the corner of a nail salon while Julian and I got pedicures and I think some kid saw it while he was waiting for his mom and took it home. Cuss. And that's where that one ended. This brings us to today, September 14. 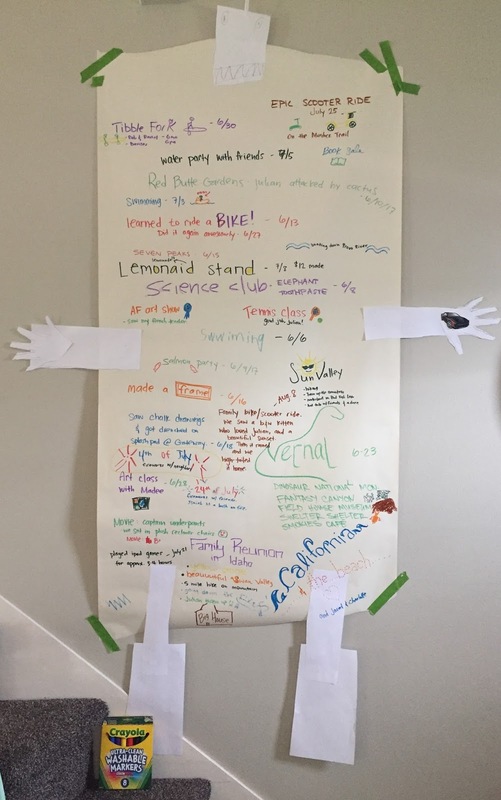 I won't bore you with all the summer details but I will say this: At the beginning of the holiday, (-- I'm still being Keira, apparently, and British) Julian made a robot for some unknown reason. He's not a big crafter so i don't really know why he did it and I don't think he did either. He didn't spend too much time on it but when he was done we had this huge robot we didn't know what to do with. I suggested we hang it up, because i felt like that was the mom thing to say/do. We did and then we stared at it for a day or two until we got the idea to write down all of the things we do this summer. Instead of making a list of summer things we wanted to do, we made a retroactive summer list-- things we did-- to see, at the end, all the things we had done. To be reminded of the little things that seemed small at the time but, combined together, made for one of the funnest summers ever. I'm making the pic huge so you can read everything. But the summer was fab with a few things planned and little to no pressure and i recommend taking this retro-list approach. Also, one last thing. Around the heat peak of July, I found this poem and recited it to myself whenever I could. I don't know if it'd be )en's Log without some kind of poem mentioned. Anyway, and re: blogging: I'm back! Probably! Hi Jen - I haven't looked at my blog favorites for a long time, then clicked it on tonight and ended my day with this great entry. Thanks for not giving up! I feel somewhat the same about our winters as you do summers. Ready to be done with 110 degrees, anticipating the reason I love it here. Have a great autumn! Love, Reta or Aunt Reta, whichever you prefer. Yay 😊💗 this made my day. Your seasonal feelings with AZ give me a sense of balance. Also, and unrelatedly, I should come visit! Say, January? Definitely!!! I'd love to have you come! I certainly hope you keep blogging. As I've tried to get mine going again consistently, you are a source of inspiration to keep the pseudo journal going. By the way, I just copied you in a post that will be published later tonight.